From 1980 to 1995, adult-onset asthma rates in the US for adults between the ages of 35 and 64 increased over 60 percent. Plus the CDC has reported that from 2001 to 2009 asthma cases among adults grew by 4.3 million. Asthma has also become the most common chronic disease in children. According to the American Academy of Allergy, Asthma and Immunology, asthma affects over 9 million children in the US alone. Let’s look at the different types of this startlingly common condition as well as how you can help ease asthma with your diet and other measures. There are actually three different types of asthma. Extrinsic asthma is triggered by an allergic reaction and tends to be seasonal in nature. This comprises at least half of the asthma cases that are diagnosed. Occupational asthma is caused by a hypersensitivity to chemical substances, usually plastics. Intrinsic asthma is triggered by something other than allergies—such as anxiety, stress, exercise, cold air, dry air, hyperventilation, smoke, viruses or other irritants. In all three cases, the end result is the same—narrowing in the bronchial airways caused by both smooth muscle contractions and mucus and inflammation which makes breathing difficult, especially exhaling. Unfortunately, although they can provide some relief, asthma medications can also cause a Pandora’s Box of health challenges. Antihistamines suppress an existing allergic reaction by blocking the inflammatory actions of histamine, but they don’t address the underlying cause—why the immune system is overreacting to begin with. Plus antihistamines can cause drowsiness, headaches, stomach upset and drying of mucus membranes. 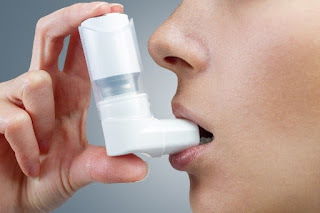 Bronchodilators (inhalers) are another option but you can become dependent on them and have to use them all the time just to keep your airways open. Their side effects include rapid heartbeat, increased blood pressure, insomnia, headaches, dizziness, palpitations and anxiety. And corticosteroids are useless during an actual asthma attack, so they’re usually used alongside an inhaler. What many asthma sufferers don’t realize is that you can make a big difference in how you feel by addressing some of the underlying factors behind asthma…starting with your diet! Cruciferous vegetables (broccoli, arugula, cabbage, cauliflower, turnips, radishes, collard greens rutabaga and Brussels sprouts)—helps with liver detoxification and support. Chili pepper—a vasodilator that enhances blood circulation and stimulates digestion. Also protects against chemical carcinogens. On the flip side, there are also foods (and substances) that asthmatics shouldavoid as much as possible. Dyes and preservatives—can be asthma triggers. Especially guilty is Yellow Dye No. 5, also known as Tartrazine. Probiotics can help with asthma naturally from within...encouraging your body to produce more “helpful T cells” and to react more appropriately to environmental factors without the typical inflammatory response seen with asthma and allergies. And Super Shield multi-strain probiotic formula is as good as it gets, especially for asthma sufferers! Super Shield contains the probiotic strains Lactobacillus rhamnosus and Bifidobacterium lactis, both of which have been heavily studied and shown to be helpful to asthma and eczema sufferers. The Omega-6 and Omega-3 essential fatty acids (EFAs) in your body work to stir up and then reduce inflammation. Omega-6 EFAs activate your body's defense mechanisms like blood clotting, inflammation and allergic reactions. Omega-3 EFAs reduce inflammation, calm your nervous system and reduce cholesterol and clotting in the blood. This system works ideally as long as you have a ratio of Omega-6: Omega-3 EFAs between 2:1 and 5:1 in your body. But the average American diet has truckloads of inflammation-stirring Omega-6 fatty acids and next to NO Omega-3s, causing our ratios to skyrocket to 10:1, 25:1 or even 50:1 or more! And we have the inflammatory conditions (including asthma) to prove it. But you can help reduce inflammation dramatically and fight asthma by replenishing your Omega-3 supply with a high quality fish oil supplement like VitalMega-3. VitalMega-3 is a pure, super-potent, fish oil formula that delivers an inflammation-fighting 600 mg. of EPA and 400 mg. of DHA--the "shining stars" of Omega-3 EFAs. Many studies have shown that food allergies play a significant role in asthma. Common food allergies are wheat, corn, dairy, peanuts, eggs, and processed foods with artificial colorings. Remove carpets if possible, wash your bedding weekly in hot water with additive- and fragrance-free detergent, and use an air purifier, especially in your bedroom. You too can feel better! If you are dealing with the challenges of asthma, it can make a huge difference when you help your body naturally from within and address some of the underlying factors behind asthma. See how much better you can feel. Mr. Young, Thank you for your additional information as well as taking the time to comment. Our hope for our readers is to gain and share as much information as possible to improve and maintain their health. Having qualified professionals such as yourself chime in is invaluable to our readers. We look forward to hearing from you on future blogs. Thank you for your feedback, Jaci. We welcome any additional information that may help our readers. Have a wonderful day!